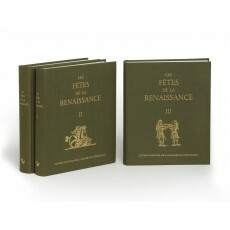 Three volumes (24 cm), 492, 518, 661 pp. Uniform publisher’s green cloth bindings. - Volume 1 is second edition (a facsimile reprint of the 1956 edition); volume 2 a reprint of the 1960 edition; volume 3 first edition. ¶ Excellent, unmarked copies. (24 cm), 492 pp., 48 illustrations. Publisher’s green cloth. - Contains thirty papers read during a conference at the Cercle Culturel de Royaumont, 8-13 July 1955, by scholars of the first rank. The two lengthiest papers in the volume discuss wedding festivities in Nancy during 1606 and Henri II’s entry into Paris and the “révolution poetique” of the Pléiade in 1550; a half-dozen studies deal with English masques and other festival occasions. Facsimile reprint of the 1956 edition. (24 cm), 518 pp., 47 plates. Publisher’s green cloth. 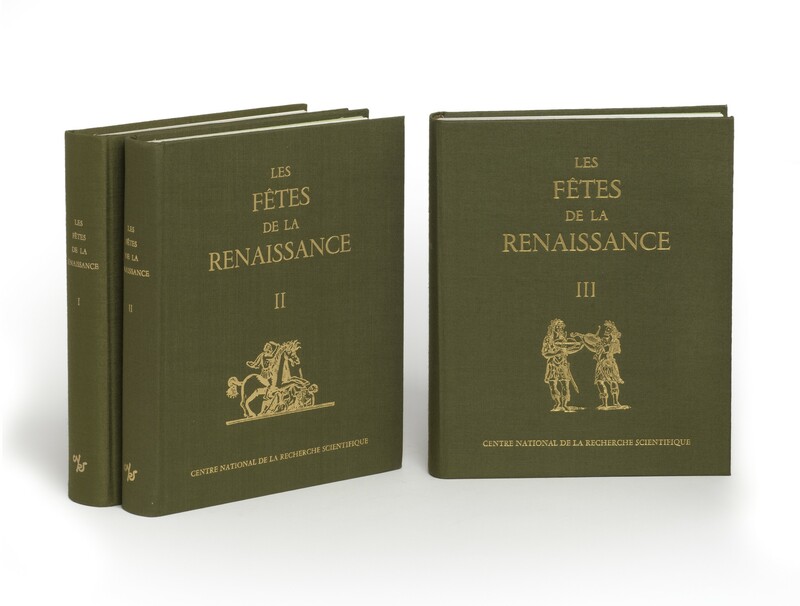 - A collection of papers read at meetings in Belgium in 1957, devoted to entertainments organised during the reign of the Emperor Charles V. Facsimile reprint of the 1960 edition. (24 cm), 661 (5) pp., 50 plates. Publisher’s green cloth. - This collection of papers, deriving from a colloquy organised by Jacquot at Tours in 1972, contains thirty-five essays, the majority studies of particular festivals, including five on carnivals at Nuremberg, Rouen, and elsewhere. Original edition.